Web developers have a duty to ensure their shiny new web site or application works on a variety of browsers. At the absolute minimum, that means Chrome/Opera, Firefox, and Internet Explorer. Ideally, Safari and a few mobile iOS and Android browsers would complete the job. Testing is not easy. It’s laborious and our efforts are thwarted by the availability of browsers on our OS of choice. Windows/Linux users cannot install Safari and Mac/Linux users cannot install Internet Explorer. Services such as BrowserStack can help but are only suitable for basic testing because it’s difficult to use developer tools. The most viable option is to use another PC or install the OS/browser in a virtual machine environment such as VirtualBox, VMware or Hyper-V.
To their credit, Microsoft provide a range of VM images at modern.ie but the downloads can be several Gigabytes in size because they include the whole OS stack. They also expire after several months. It’s not conducive to quick and dirty testing and, somewhat understandably, many developers don’t bother. Fortunately, Microsoft has created a faster, slicker option. 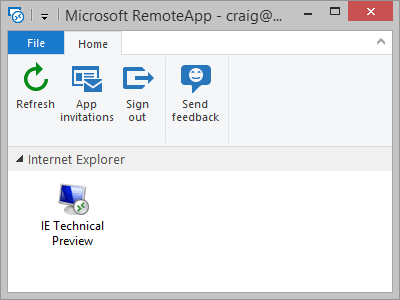 RemoteIE allows you to run the latest version of Internet Explorer from the cloud on Windows, Mac, iOS, or Android without having to install or manage a virtual machine. The free service is currently in beta but it works and is technically stunning! To start, visit remote.modern.ie and sign in with a Microsoft account. You may already use one if you use Windows 8+, OneDrive, or Outlook.com. You’ll then need to wait for your RemoteIE access to be approved — I received an email after a couple of hours. You can then download the Azure RemoteApp which is available for Windows (32 and 64-bit), Windows RT, Mac OS, iOS iPhone, iOS iPad, and Android. This is typically around 15MB; it varies from device to device but need only be installed once. It’s a full version of the browser with access to the F12 developer tools. You won’t be permitted to access the settings or install add-ons, but it’s fast and ideal for quick site testing. ngrok will return an address such as http://abcd9876.ngrok.com/ which you can enter into RemoteIE (or pass to anyone off-site) for further testing. 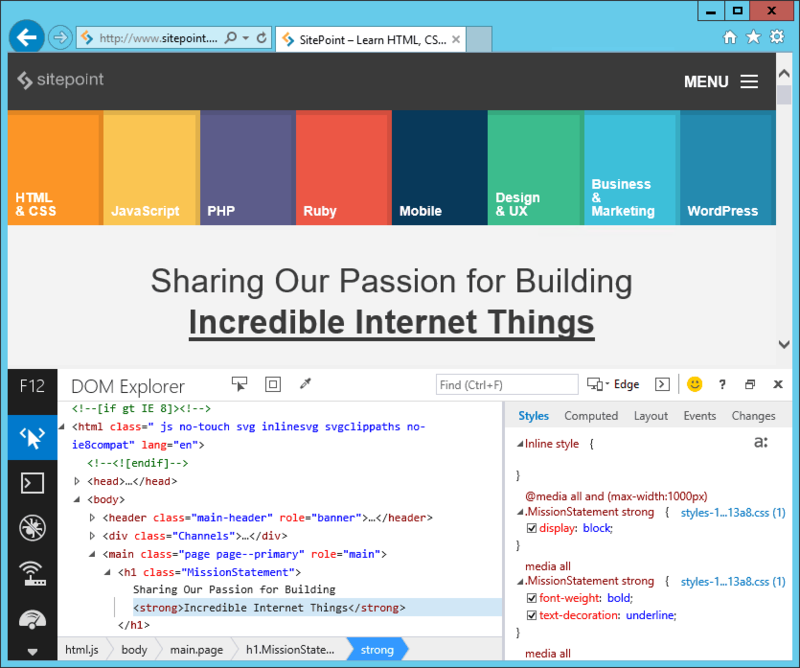 RemoteIE will revolutionize Internet Explorer testing for many. However, remember that it’s currently a beta service and usage is limited — it took me several attempts to gain access because others were using it. You’ll only have an hour to test your site and will be booted off if you’re inactive for more than a minute. There’s no Linux support. I guess this is technically possible given it can be run on Android and Mac OS but it’s not available at the time of writing. You can only test the latest IE. That’s the most useful version but it’s normally well-behaved and you’ll experience far fewer issues than IE8. Microsoft is considering other versions but this will become increasingly unnecessary given that IE8 usage has dropped below 5%.